Pumpkin chutney is a vegetable based chutney which is both yummy and healthy. This goes well with idli, dosa and rice also. 1. Remove the seeds and skin of the Pumpkin. Then grate it using the grater. 2. Heat 1 tbsp of oil in a pan, add Bengal gram dal and fry for a min. 3. Next add red chillies and fry for a few seconds. 4. 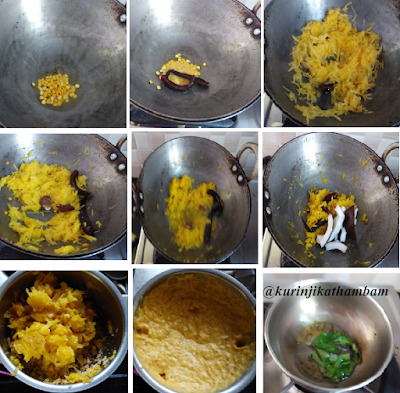 Now add the grated pumpkin and fry till they become translucent. 5. Add the tamarind and fry for a min. 6. Then add ¼ cup of water, Mix them gently and close the lid of the pan. Cook till the mixture becomes dry. 7. Switch off the flame and allow it to cool down completely. Add the grated coconut and grind with little water into a fine paste using the mixie. 8. Transfer the chutney into the serving bowl. 9. 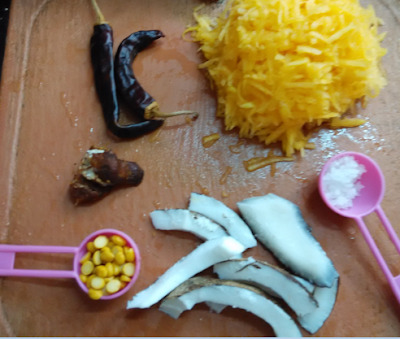 Heat ½ tesp of oil in a pan, add mustard seeds and urad dal. Wait for popping. Add curry leaves and fry for a few seconds. 10. Mix this temper with chutney. 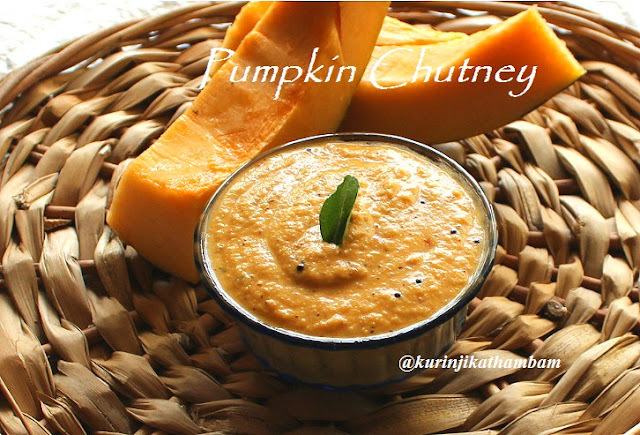 Tasty and healthy pumpkin chutney is ready.